Meet 6 month old Wesley. This smiling little boy had open heart surgery on Sunday – just three days ago. The VSD surgical repair to his heart was to fix a congenital (birth) defect. During his short life so far his mother Esley told me that he was frequently unwell and always felt sick. 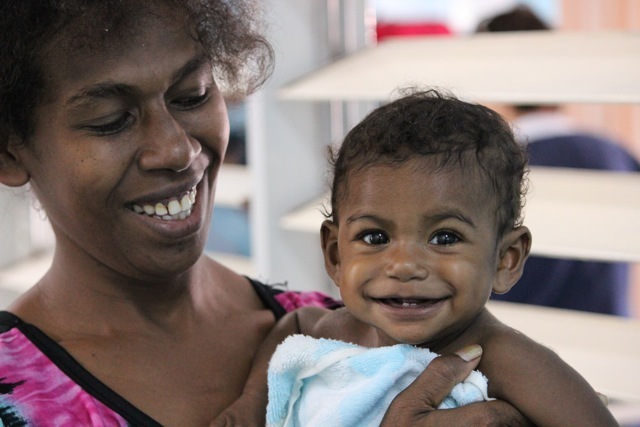 His condition was suspected shortly after birth and confirmed by one of the local PNG cardiologists during one of the clinics in their city of Rabaul. Esley and Wesley were flown down to Port Moresby ten days ago for further diagnosis with the Australian cardiologists. EWesley is all smilessley was delighted that he was selected for surgery by the team. His surgery was performed by one of the locally trained surgeons Dr. Noah Tapaua under the supervision of Dr. Graham Nunn.